It had been a culmination of a stressful evening, brought on by a horrible and very public confrontation between Lily Doyle’s father and his longtime enemy, Sean Flynn. Morgan had been so rattled and worried for Lily that she’d responded by drinking more than she normally did, which had lowered her staunch defenses against her supersecret crush on Ryan. Her heart had pounded like a battering ram as he held her close—too close. His bristled jaw had rubbed gently over her cheek, and she’d thought he was going to kiss her right there on the crowded dance floor. Under the influence of alcohol and nerves—and yes, sheer lust—her smarts had evaporated in the heat of Ryan’s mysterious gaze. V.K. Sykes' Seashell Bay is quickly becoming one of my favorite fictional places to visit. 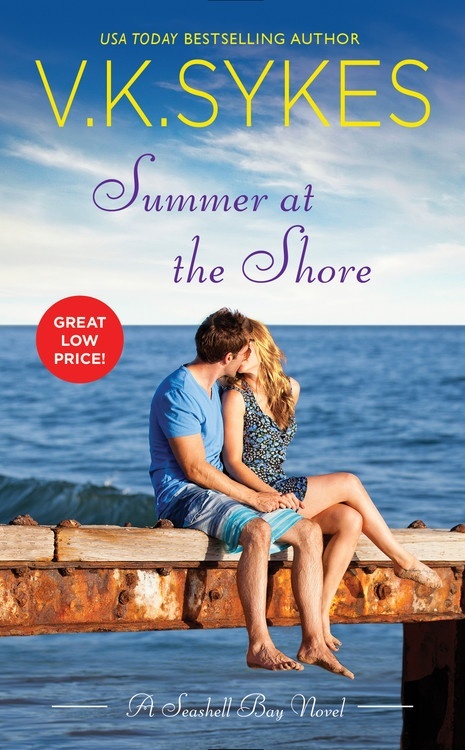 In Summer at the Shore, the second book in this heartwarming series, this talented writing team brings us the story of Morgan and Ryan, lifelong friends who have always had feelings for one another simmering below the surface but have never acted upon them. Until now, when circumstances bring both of them home for the summer. One of the things I most enjoy about Sykes' writing is their ability to create complex, fully-dimensional characters. Ryan and Morgan face the daily dilemmas and decisions that many of us have to deal with. Ryan is at a crossroads in his career and must choose the direction that will be best for him while Morgan's beloved teaching career has been derailed when she's forced to return home to help her special-needs sister try to save the family's struggling B&B following their father's unexpected death. Adding the growing feelings between them makes the decisions they must make even more difficult, as would be the case in real life. Sykes has given us realistic characters facing everyday challenges, heartaches and joy. As with the first book in the series, Meet Me at the Beach, this new book is not only about the hero and heroine. Sykes has created a community of hard-working, sometimes quirky, characters who are seamlessly interwoven throughout Morgan and Ryan's story, exactly as would be the case in any small town. We catch up with main characters from the first book and meet characters who will undoubtedly star in future books without ever losing focus of the main couple in this book. Seashell Bay is a community, with all it's pros and cons, and Sykes captures that beautifully. Each visit to this fictional island off the coast of Maine only makes me more excited for the next one. I highly recommend Summer at the Shore for your summer reading list. What are your favorite fictional places to visit this summer? The beach? Mountains? Somewhere exotic? Have you visited Seashell Bay yet? I'll be taking lots of books along (on my Kindle) when I go to the beach this summer. Where's your favorite place to read during these hot months? Thanks so much for hosting us today!! I agree with you about Seashell Bay, PJ. I really enjoyed Meet Me at the Beach, and I look forward to reading Summer at the Shore later this week. Hope you enjoy it as much as I did, Janga! I've read the first Sykes book and have this one on my TBR list. Thanks for sharing your thoughts, LSUReader. Authors and publishers (many contests are run by them) need this feedback from readers. My favorite place to visit is a cabin on a small lake in the woods of the Northeast. My family owned one, friends have them, and we have stayed in them a time or two. If we owned one, we would spend most of the year there. I have not yet started this series, but will soon. It is so hot and humid here in the South, that I pretty much hide inside and read on my sofa. Luckily, the corner of the porch is in the shade and there is usually a good breeze. When it is cool enough, I'll read out there. That cabin sounds wonderful! I grew up on a small lake and love being near the water. LOL! I hear you on the coolest place. With all the high temp records we've been setting this month, cool places have been hard to come by! Our home is in the San Fernando Valley in Southern California. It can be one of the hottest places in SoCal no matter what the time of year. So when the temperature starts to climb we head to our place overlooking the water in Ventura. It's only a 45 minute drive to get there, but it is also usually a 30 degree drop in temperature! I take my Nook with me and read surrounded by sea breezes and stunning ocean views! PS. 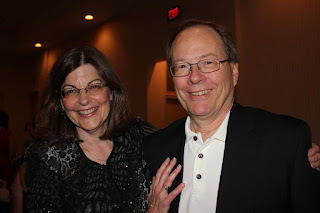 Vanessa and Randy, congratulations on this new release and I hope we get to see you at RWA next month. I read and loved Meet Me at the Beach, so yes, I have visited Seashell Bay. I've been on a beach reading kick lately, having just finished Maria Geraci's Whispering Bay series and now reading Beach Town by Mary Kay Andrews. My favorite cool place to read is in my living room with the drapes closed just enough to keep out the bright summer sunlight.